American progressive heavy metal! Guitarist Rob Johnson also has several solo albums out. Yet another band that I had heard much about long before I had ever heard them. Once I heard them I couldn't put get the disc out of my player. 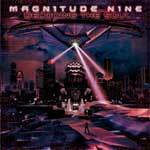 Magnitude 9 mix the heavy sounds of heavy metal with progressive songwriting and great vocal melodies. This particular cd is a Brazilian re-issue that contains four bonus tracks, a smokin' version of "Man On The Silver Mountain" and three shred instrumentals taken from Rob Johnson's solo disc "Guitarchitecture." 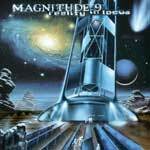 Magnitude 9 are one of those bands that have unfortunately been labeled a progressive metal band. In the 70's "progressive" meant bands that were constantly changing and refining their sound, usually mixing different styles of music together. Most of the popular bands sounded nothing alike. Yes, Pink Floyd, Genesis, King Crimson, Nektar, etc. all had a very unique sound yet were all labeled progressive rock. Progressive metal started out much the same way, but something happened in the 1990's after the released of Dream Theater's "Images and Words". Suddenly every band labled "progressive" were sounding like one of two bands; Fates Warning or Dream Theater. It is now rare to find a band labeled "progressive" that isn't a clone of some sort. Thankfully, Magnitude 9 sound like neither band. This CD is much more listenable then a lot of popular progressive metal (Symphony X, Dream Theater). Magnitude 9 also don't fall into the trap of trying to cram a hundred different riffs in every song. So, having said all that, I would say that "Decoding the Soul" should rather be labeled melodic heavy metal since the band fuses power metal, along with prog metal and 1980's vocal harmonies, not unlike Seventhsign did on "Perpetual Destiny" or any of the Lance King-led Balance of Power CD. Imagine a mixture of Dokken, TNT and Fates Warning with an occassional burst of Yngwie Malmsteen and you might get an idea of what to expect here. In other words "Decoding the Soul" is simply a great melodic metal CD.